The Teatro de la Zarzuela has concluded its second era under the direction of José Antonio Campos, whose ties with the institution are fortunately not at an end, as he is moving on to head the fiscal organisation upon which this and the other national theatres depend. His farewell coincides with the revival of the beautiful production of Doña Francisquita first seen here in 1998, although previously mounted in Buenos Aires and Washington. The custom of straightforward revivals should be more frequent at the Teatro de la Zarzuela. Every production is expensive, and it is genuinely sad - not to say wasteful - that many do not return after the first run. But obviously the policy of revivals cannot be allowed to dictate a limitation on the number of new shows. It is for that reason equally essential to call for an increase in the number of productions programmed annually. That a state theatre open all year round and dedicated almost exclusively to in-house productions mounts only four or five zarzuelas each season is very limiting, in that it doesn't accord fully with programming policy. It is the aim to include género chico, zarzuela grande from the 19th and 20th Century, European operetta, baroque and contemporary opera, plus other forms of musical theatre beyond the borders of conventional opera, and to achieve this by a combination of revivals and new productions. Yet it is evident that the policy cannot advance with so few shows in the repertoire. Luis Olmos, the new director of the theatre, will have to look for a way to increase the number of productions without losing anything in artistic quality; this way the theatre's artistic project can move forward. To return to the staging of Amadeo Vives's work, this co-production between the famous theatre in Madrids Calle Jovellanos and the Teatro Colón of Buenos Aires is a stylish and brilliant reading, full of colour and light, both interpretatively and in design. 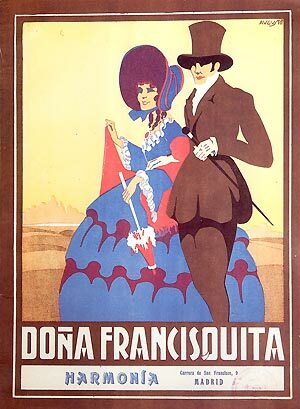 Doña Francisquita is a key work in the history of zarzuela, one of its most acclaimed products as much musically as theatrically. But putting aside for a moment its many virtues, it is also emblematic both for an institution and a singer highly significant in the annals of the Spanish lyric stage - the Teatro de la Zarzuela itself, and the tenor Alfredo Kraus, associated with the work for many years. 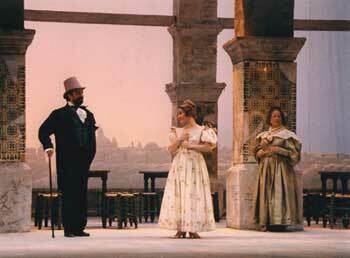 Amadeo Vives's masterpiece likewise made a bond between theatre and singer - Kraus was the nonpareil Fernando from 1956, when he was also making his Madrid debut, at which time the Sociedad General de Autores acquired and re-opened the theatre, deciding to dedicate it to the genre after which it was had been named at its foundation one hundred years earlier. The main roles in the two performances I saw were played with undimmed success by the same quartet of soprano, tenor, mezzosoprano and tenor cómico. Milagros Poblador knew how to give her Francisquita a grace and elegance not at odds with the work of managing human passions; her sublime singing charmed the ear at all times. For his part Darío Schmunck was vulnerable and sensible; although we are accustomed to bolder Fernandos, this reading of the sensitive man of the story accords with the works original spirit. This is what the librettists and composer made of Lope de Vega's more determined hero Lisardo, adapting him to the limited stage gifts of the tenor Juan de Casenave - excellent singer though he was - who took part in the zarzuela's premiere. Schmunck fearlessly confronted all the vocal difficulties of this long part, and came through them well. Milagros Martín got her teeth into the part and made a very forceful Aurora; nevertheless, vocally she is not in the final analysis quite ideal for this role. Santiago Sánchez Jericó's Cardona is exemplary; his limpid singing line and impeccable knowledge of how to say and do everything required made him essential to the stage, where we hope to see and hear him again soon. Amongst the character singers the Doña Francisca of Trinidad Iglesias and Don Matías of Alfonso Echeverría gained stage presence as the month's run advanced. Perhaps the revival suffered from limited rehearsal time. The other vocal soloists, chorus, actors and dance group fulfilled their tasks notably well. Franca Squarciapino's costumes, Ezio Frigerio's settings and the lighting of Eduardo Bravo, meshed well together; and the stage direction of Emilio Sagi is irreproachable. Eight years on from the first run it's just as admirable. The musical direction of José Ramón Encinar, Director of the Orquesta de la Comunidad de Madrid - which has its own programmes as an adjunct to its work as the theatre's pit orchestra - demonstrated the great rapport this Madrid composer and conductor enjoys with his musicians. It gives great pleasure to see how highly the theatre scores with such a finished production of one of the unquestioned classics of the zarzuela; let's hope we will get to see this excellent staging many more times. These performances of Doña Francisquita were dedicated by the company to José Perera, who was for many years Director of the Chorus of the Teatro de la Zarzuela, as well as the celebrated Coros Cantores de Madrid which made so many famous zarzuela LP recordings. We take this opportunity likewise to recognise this musician's fruitful work on behalf of Spanish lyric theatre.